Always did like Autumn……. still do. The nip in the air, colorful leaves floating to the ground---all seem to make me remember and reflect about the years. It’s Fall now as I write this. Me and the dog (Storm) are preparing to take our last ritual backyard outing before joining Mrs. R. for the late news in bed. Opening the back door, I am engulfed in the aromatic smell of neighborhood fireplaces. As Storm takes off to survey his favorite spots in the yard, there on the back porch I am drifting back to lazy Autumn afternoons on my old Newark streets, a time today’s kids will never know. That fireplace smell always triggers the memories, almost like the smell of roasting chestnuts that you may remember from high school football games, street vendors, or maybe at Thanksgiving. That smell most closely resembles the Autumn aromas I remember, when folks burned all those dry, crispy leaves, usually in the gutters in front of their homes. Can’t do that now because of the air pollution laws and ordinances, and I think we are poorer for it. Walking home from school, I could hear and see folks raking leaves into big piles. Usually, pipe-smoking, retired men of the neighborhood undertook this task. From the big pile of leaves, a small pile was separated, lit afire and watched closely. As the small pile was consumed, more leaves from the big pile were added to keep the smoldering mass alive. It was an art of the season. Folks didn’t just set a big pile of leaves ablaze and walk away. It was carefully monitored. A garden hose was usually nearby to prevent a quick flare-up, and used to douse the small fire after it was about done. Most folks also had a trash barrel in their yards then too, often a 55 gallon drum that had been pierced a number of time at the base to allow air to enter so lumber scraps, cardboard, paper waste, leaves, and other yard waste could be burned. Set up off the ground on several sturdy bricks, the old family trash burner was the last link in the recycling of waste. If there were freshly washed clothes on the neighborhood clotheslines (there is something you don’t see much today), folks were courteous and didn’t burn trash that might soil the newly cleaned clothes. A little neighborhood courtesy went a long way. I vividly remember playing football in the street after school, a wispy haze of blue smoke permeating the trees and colorful clinging leaves. The last rays of the sun’s fading afternoon warmth created a lovely series of light rays through the lazy smoke. That will always be Autumn for me. As the sun dipped low, we usually crowded around the smoldering leaves to get our hands warm so we could continue to play ball. You didn’t worry about air pollution then. Can you remember when they used to burn the meadows back then? You could look all the way down Bloomfield Avenue and see the black smoke in a long line as they control burned sections of the dried meadow grasses and vegetation. Many old time gardeners took the ashes from the burned leaves in the street and added them to garden and flowerbeds to increase their fertilizer content. In spite of all the recycling hoopla we hear today, the old-timers were quite resourceful and frugal. They were not ignorant of the lessons of nature. The lovely and fragrant custom of burning leaves had a purpose, and tradition. My wife remembers ice-skating to the smell of wood and leave fires, not far from where we now live in her childhood home in East Orange; all of 3 miles from where I grew up in Newark. I didn’t stray far after high school and college; and I like it that way. This time of year I have an urge to light a small pile of leaves in my backyard and remember those Newark afternoons. It was so easy then….. play ball after school, have a nice dinner with the whole family, do your homework, and watch some TV. What a safe and secure life, and what memories I have of that warm loving home and my old Newark neighborhood. Oh, I see Storm is done with his evening romp among the wilds of the backyard, time to close the house up, turn down the thermostat, and hop under the quilt. Storm will snuggle in between Mrs. R and me. We’ll wake up in a few hours to the comforting sound of steam radiator valves popping and hissing, just like when I was growing up. Nothing like it. 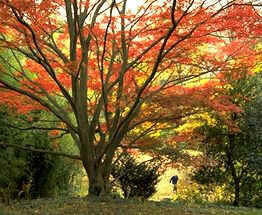 I’ll open my back door again and see my backyard ablaze with red and yellow maple trees. The front of our house is lined with tall, aristocratic 70-foot oaks, golden brown—all the way down the street. They don’t make streets like this anymore, or houses either. You have got to love this time of year.